I had originally cooked up this recipe (from Simply Recipes) with bacon, so had written it up the way I cooked it. I have to admit we were underwhelmed by this recipe, but did like it. Just before I left on my trip to Florence, Italy I was cleaning out the fridge and saw a head of cauliflower. Now that I knew I could, I did–I roasted it and threw it in the freezer. Fast forward to last night, when I was tired, the fridge is too full of stuff and I need a meal. I had picked up some prosciutto (which I didn’t have before) and decided to give this another go. Wow. What a difference. The only changes I made were to roast the defrosted (already roasted) cauliflower for only 10 minutes, along with the tomatoes (using the sweet sugar cherry toms that I had) and to change out the pasta for a similar shaped type. I chopped the prosciutto with the garlic and fresh sage from my garden (the only thing that seems to have survived this heat! ), mixed it in when the recipe said. My husband loved it, and so did I. This picture is from try Take Three, this time with the spinach added in. Manna. 1 Preheat oven to 425°F. Lay out cauliflower and tomatoes in a roasting pan, coat with olive oil and sprinkle with salt and pepper. Roast until just lightly browned and cooked through, about 15 minutes. 2 Bring a large pot of salted water to a boil (1 teaspoon salt for every quart of water). 3 While water is heating, pulse garlic, sage, and prosciutto together in a food processor until coarsely chopped. Once cauliflower has browned lightly, remove from oven, toss cauliflower with garlic prosciutto mixture, and return to oven to cook for 5-7 minutes more. 4 Boil pasta uncovered (rolling boil) for 9-10 minutes until firm, but done (al dente). Reserve one cup of pasta liquid. Drain water from pot. 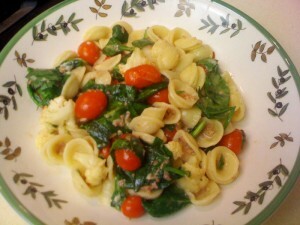 Add cauliflower, arugula (or spinach), and Parmesan to the pasta. Stir in enough cooking water to moisten (I added about 1/2 cup). Add salt and pepper to taste. While I couldn’t seriously join the Hippies (I disagreed with too much of what they were saying and I liked wearing my bra) this cultural movement had an influence on our kitchens. One tenet was the back-to-the-land idea, of beating The Man at his own game by making or raising or growing your own vegetables. My contribution was learning to cook, as well as making some items from scratch, one of them being yogurt. I realize that while I attribute this impulse to the Hippies, it could have just as easily come from Sunset Magazine, with its pictures of women wearing triangular head scarves, fringe and multiple rings. Many of my recipes hail from that magazine. I used to make this up (it makes a lot), store it in the fridge and use it all week long, scooping out the yogurt for breakfast and after-school snacks. Soften 3 packages unflavored gelatin in a small amount of the warmed milk. Add this to the warmed milk, then cool to 120 degrees, stirring often. Add a small amount of the warmed milk to 5 Tablespoons unflavored yogurt (with active cultures–Dannon works well–read the labels), then pour the yogurt mixtures back into the milk mixture and stir well. Pour the milk mixture into four clean large canning jars (1 quart size). Lid them, then place all in a large pan and fill the pan up to their rims with 120 degree water. (I used my water bath canner–don’t let the bottles float–stop adding water if they start to wiggle around too much.) Wrap this all in blanket and leave for 12 hours on the counter, undisturbed. Remove from water and place in the refrigerator until chilled. Some weeks after the fire, one of her neighbors found out where she was living, and brought her a loaf of her own bread, with the recipe attached to it. Little by little, her recipes came back to her, because she shared them. Little by little, she rebuilt her life. My mother cooked for a crowd: her family of seven children. I remember coming home as a teenager to the smell of this bread, freshly baked. It was perfect in the afternoons, just warm crumbly bread, some homemade jam, and a glass of milk. Of course the fantasy memory might include then happily skipping off to do the homework, but I think the real memory probably was slicing one more slice, in order to avoid leaving Mom’s kitchen and her good bread. This is one recipe I don’t want to lose, so I’m posting it here. When I made a batch, the bread turned out to be softer than I had remembered. How to get the *crunch* that lingered in my memory? Toast it, slice by slice in the the toaster, and drizzle with honey. Lovely. My mother and I talked about this recipe and she says it never lasts in their house, mainly because they give away one of the two loaves every time. She still is still teaching me more things than just making bread. Dissolve 2 packages yeast in 1/2 cup warm water and add to above mixture. Then add 2 eggs, mixing well, but not overbeating. Add: 1 cup wheat germ and 3 cups white flour and beat for 2 minutes at medium speed. Blend in 2 1/2 cups more flour. “Blob it in” (the recipe says) into 2 greased loaf “tins,” and let rise to within 1″ of the top of the pan. Bake at 375 degrees for 45-50 minutes. Brush tops with melted butter. I find that I’m used to a more complete recipe these days: Do I turn the loaves out onto racks immediately, or let them cool for 10 minutes in the pan? When do I brush on the melted butter? How long do I mix the dough? This is a recipe from days when most women cooked, and cooked regularly, and knew what to do. I smile at even earlier recipes that say things like “Cook in a moderate oven until done.” Translation, please? 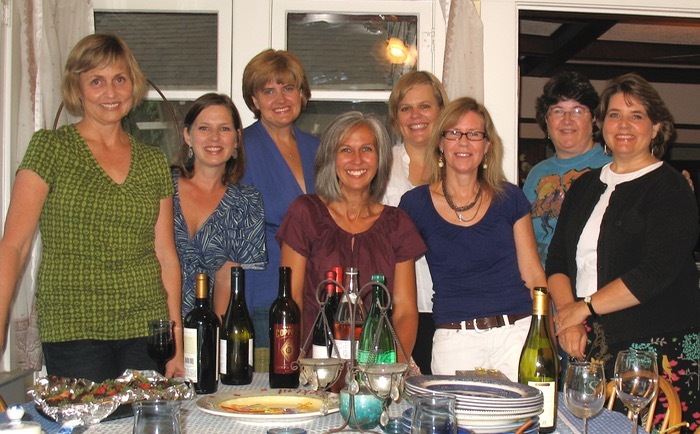 My friend Susan, tired of not seeing her friends, got a few of us together the other night at her house for what her ninth-grade daughter christened as Salon du Chocolat. Who knows why a French title, but it does sound really cool. (Maybe she’d heard about the famous one in Paris?) So we all racked our brains to come up with something French to contribute to the evening. 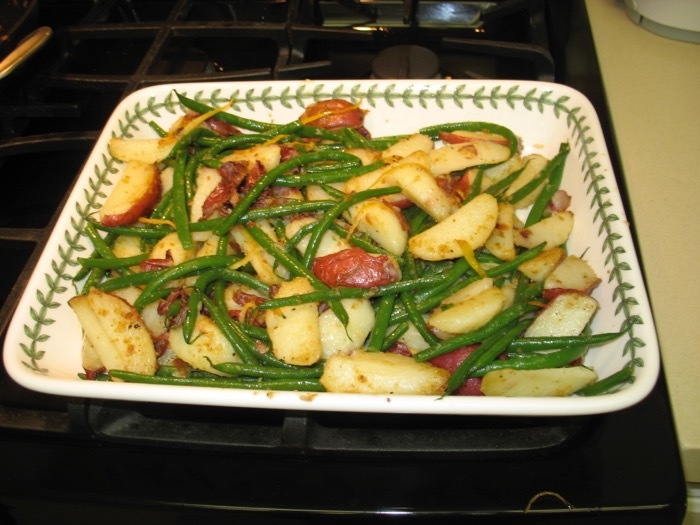 This was mine, a mixture of sauteed haricots verts, red new potatoes and strips of lemon zest. It’s not my recipe; head over to Food & Style to read all about it and even watch Viviane’s video. Then come back here and I’ll tell you what I learned. I learned that I should have cooked the potatoes earlier, like an hour or two earlier. They were too hot when I put them into the pan to saute them up. I also think you could get away with just 2 Tbls of olive oil, instead of 3, but that’s just us. 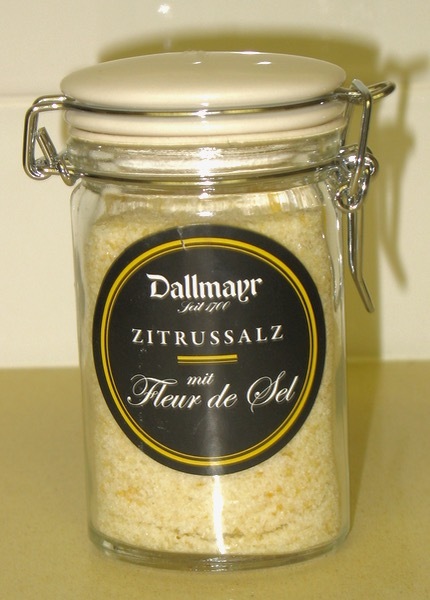 The secret ingredient I had that night was this: Fleur de Sel from the Dallmayr’s shop in Munich. I used three hearty pinches, and yes you could substitute regular sea salt if you wanted to. I walked past their food emporium in Munich and one of the windows was a like a scene from a bazaar, with large flat bowls of various types of Fleur de Sel. I chose the lemon flavor–I thought it would be the most useful, and besides the jar was really cute. In earlier days, I would have saved the jar for a special occasion–always years in the future. But now, I notice that special occasions are all around me–like tonight’s Salon du Chocolat, so why wait? Others got into the spirit as well with quiches (from Susan), tartlets (which Thatcher was quick to note was food, not tiny wayward women), ratatouille from Kara, chocolate-dipped strawberries (Kris), watermelon salad (Julie), Choux Pastry with Almonds (Jo) . Donna and Nicole joined us after the picture and I didn’t keep track of the food after that as I was in a happy haze of delicious dishes and good company. Step 1: Fill a medium heavy bottom soup pot with cold water, add the potatoes and bring to a boil at medium-high heat. Fast simmer, uncovered for 10 to 14 minutes depending on their size. The potatoes should be tender but still firm. Drain, then set aside to dry and cool. Step 3: Fill a large heavy-bottomed soup pot with water and bring to a boil. Add the salt and blanch the haricots verts(tender green beans) for 3 to 4 minutes (depending on their size) until tender, but still crunchy. Scoop them out with a slotted spoon and transfer to the ice water bath until cool. Drain on towel, then pat dry, and set aside. Step 4: Cut the potatoes in 1/2” edges. Heat a large non-stick skillet over high heat. Add the butter and olive oil. As soon as the butter is melted, add the potato slices and sauté for 2 to 3 minutes until golden. Toss the potatoes and continue sautéing for an additional 1 to 2 minutes, until golden. If needed, repeat the process until the potatoes are golden brown on all sides. Add the lemon zest, toss well and sauté for an additional 1 minute until lemon is crispy and golden. Add the haricots verts. Toss well until the beans are warmed through, about 1 minute. Add the salt and pepper, toss again and remove from heat. The other night Dave said he’d take me out, but as it got closer to dinnertime, I thought about how tired he was (we both are–this jetlag is tough this time!) and maybe it would be better if we’d just eat in. So, like most of my recipes, I hopped onto the web to find something to cook. My favorite site is Epicurious.com, an aggregation of the recipes from Bon Appetit and Gourmet magazines. I like that Foodie People comment on the recipes, warning me or helping me to cook my own version of the dish, although I must admit little patience with those who substitute nearly every ingredient then say they can’t stand the recipe. I try for a certain amount of fidelity, especially if the rating is high. The category I browsed that night was Quick Meals, but it wasn’t until the next night that I cooked this up. I’d give it a very high rating in these categories: low-fat, easy, quick, not-so-pricey and delicious. 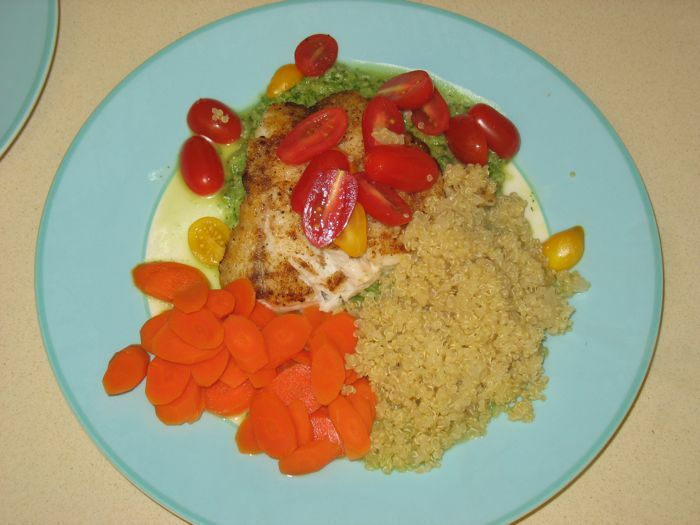 Choose a mild white fish (we used Orange Roughy) that is firm and won’t fall apart. I served it with quinoa (see recipe elsewhere on this site) and some sliced al dente carrots, drizzled with the teensiest amount of honey. We probably didn’t need the carrots, but they were good. Ladle some gazpacho sauce on each of 2 plates. Top each with 1 fish fillet. Scatter tomatoes atop and around fish and serve. Last week in Italy, for our 20th Anniversary Dinner, we had two appetizers, healthy servings of pica (homemade spaghetti) with meat sauce, and to chase all that, these white beans. Theirs were made from scratch, not canned, with bits of green onion, red onion, Italian Elixir of Life (that would be olive oil), a little salt and that’s it. Cut to today, when it’s in the low hundreds, fires raging outside, and I’ve been grading and those beans sound like a good thing to pull together. But I’m doing it SoCal style. First mix up a batch of Lemon Vinaigrette, Casually. Then get out your can opener. Open two cans of Great Northern White Beans; Ralph’s has good kind. Drain, then rinse well, then drain again, then dump into your serving bowl. Cut three 1/4″ slices off a large red onion; chop into small dice. I guess that’s about 1/3 cup. Scrape onto beans. Go out into your garden and get a couple of springs of basil and a sprig of tarragon (optional), wash then cut the leaves into ribbons, adding to the bean mixture. Having visited Costco recently, of course you have some deboned rotisserie chicken in bags in your freezer (about 2 cups each) and you actually remembered to thaw one out today. Chop that coarsely, and add to the melange. Pour the Lemon Vinaigrette over everything and gently stir with a spatula. Let sit until you are finished with your grading, or your project or until your spouse comes home, about 1 hour. Chop some fresh tomatoes (about 1 large, or 3 Romas) into 1/2″ dice, and place into a separate serving dish. When you were at Costco, you also remembered the Bake-Your-Own-Tortillas so cook some of those up, keeping them warm either in your cheezy styrofoam tortilla container, or a (clean) folded dish towel. Serve the beans in a shallow bowl, accompanied by the tomatoes and the tortillas. An easy supper on a hot day, but I think this would even be good on a cold day, if you heated everything up. This is a really easy recipe. Just whisk it together and enjoy. First, squeeze the juice of 1 lemon into a medium bowl. Add a shake of Herbes de Provence, a few grinds of salt and pepper, about 2 Tbls. water and about a 1/2 teaspoon of sugar. Whisk to blend, then add about 1 Tablespoon Dijon mustard (a healthy squirt) and whisk again. Keeping that whisk going, dribble in olive oil until it starts to thicken, then add some more. I probably use about 1/3 to 1/2 cup in total. Don’t measure–just concentrate on it going from watery looking to slightly thicker as it emulsifies. That’s your lemon vinaigrette.